Senmonten is a restaurant located in Gion that specializes in gyoza dumplings. The restaurant's clean interior has both counter and table seating. The dumplings are characterized by their small size; they can be eaten in one bite. Also, the filling contains a lot of napa cabbage than meat giving them a light flavor. The dumpling wrappers are thin with a crispy texture. I know some people can be concerned about the smell of dumplings as they contain garlic, but at Senmonten, no garlic is used. The dumplings have no strong smell and because of this are especially popular with women. These bite-sized dumplings are made from beef, pork, naba cabbage, and leek. The sweetness of the cabbage and the umami of the meat are balanced perfectly in these light-flavored dumplings. There is no strong garlicky smell to them. 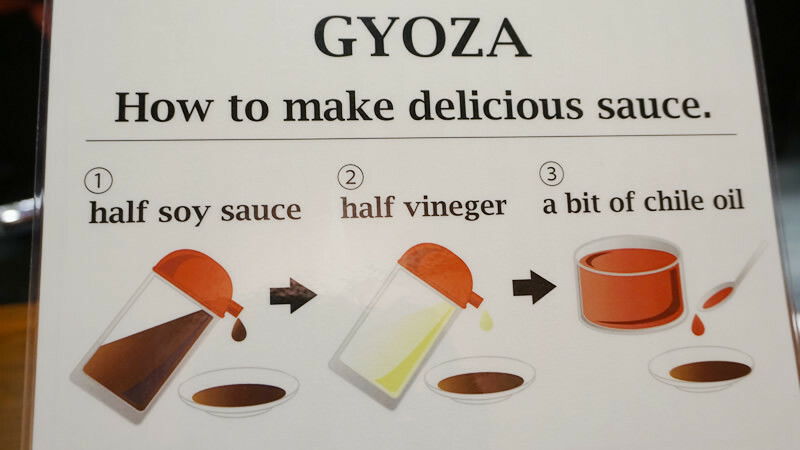 You get to mix a dipping sauce yourself from soy sauce, vinegar, and chili oil. Onigiri, or rice balls, are a Japanese classic. These rice balls have just the right amount of salt in them, and they are topped with fragrant sesame seeds. The best way to enjoy them is to also dip them into the dumpling dipping sauce. Fresh, juicy cucumber is served to you pickled. They are not too salty, and they make a refreshing change from the dumplings. They are a great palate refresher to be had with the dumplings. They have a menu in English and Chinese too. If you are hungry, I recommend ordering some rice balls with your dumplings. English instructions on mixing dumpling dipping sauce are also available. 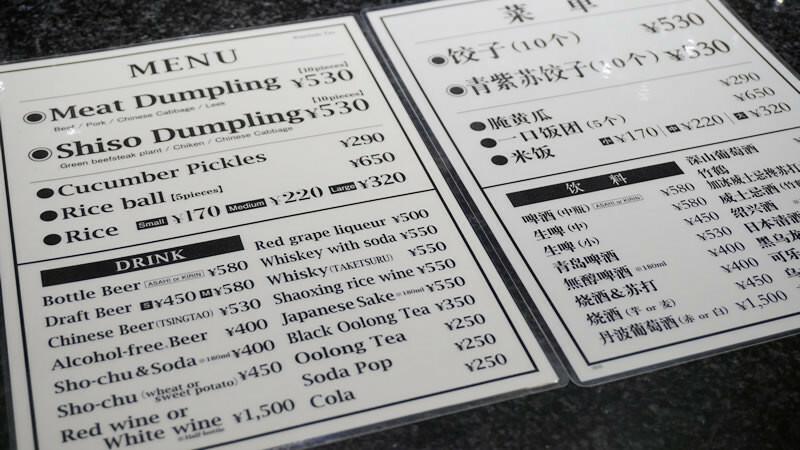 In addition to their normal gyoza, they also offer shiso dumplings which contain shiso leaf, also known as beefsteak plant. If you visit with a group, it’s a good idea to order both types of dumplings to share. The dumplings are small and the taste light, so they are a hit with women! They are so small that you can eat quite a lot of them. The restaurant has a lively atmosphere and is a good place to have fun with friends. If you go out drinking in the Gion area, consider making this restaurant your last stop of the night. You can also get dumplings to go. 6-minute walk from Keihan Line Gionshijo Station. 9-minute walk from Hankyu Line Kawaramachi Station. 6pm-8pm tends to be busy. Usually gets quiet around 10pm. English and Chinese menus available. English instructions on mixing dumpling dipping sauce are also available.